Turn One Pound Into One Million: I won the Clixgrid! Clixsense has a selection of different ways that yo can earn or win money. I have just won the highest amount I have ever won on one of the games - Clixgrid. I will explain more about how you can earn on the site below. Pay to click is how this site started and you basically view adverts and get paid. The longer the advert lasts, the more you get paid. There are usually some opportunities each day but it does not pay very well. This is the place where I make the most money on the site. There are lots of surveys that you can potentially answer but you have to get through screening process first which means that you can waste time answering questions and not getting paid. However, I find it a fun and relaxing way to earn some money with very little effort. The offers come form a big range of different companies, which means that there are lots to choose from. Some are surveys but you can also get paid for downloading apps, buying things and signing up for different things. Some of these will generate a lot of spam email, but many people set up an email account just for this so that they can easily filter through it. I have not personally had much luck with tasks. they include rewriting and reviewing things, I think. Recently there have been no tasks available for me to do. The clixgrid is a game where you have the chance of winning money. You have the opportunity to click squares in the grid. You will then be shown a ten second advertisement and afterwards will be told whether you have won. There are prizes up to $10 to be won, but I have only won a couple of times with my $0.25 being the highest. As with most sites like this one, you can get paid for your referrals activities. Over the years I have made a fair bit of money form my referrals, so a big thank you to them! If you referrals become premium members or buy advertising you can make a lot more money from them. 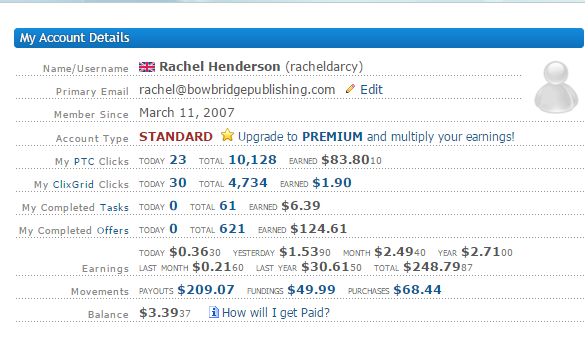 Over the years I have made a fair bit of money form this site, but have been a member for a long time. However, I have not always been an active member so those earnings have been sporadic. The picture below is a bit small but it shows a summary of my earnings but this does not include referral earnings which have been $26.47.